arranger, producer and performer. She began her quest for global violin shenanigans at age 5, and performed with the Honolulu Symphony at age 7. Upon moving to Sacramento, California in 1981, she continued her violin studies, with a small break to pick up the alto sax, because that's what was playing on the radio and it was way cooler...or so she thought for a whole year. In high school, she became the youngest member of El Dorado County's Sierra Symphony. In 1990, she won the talent competition and a college scholarship from the Miss El Dorado County Scholarship Competition. Finally, to round-out her high school experience, she also found pride in setting the womens record for Ponderosa High School at the 1991 California Alpine ski-racing state championship. From 1991 to 1995, Kathy performed, acted, sang, and danced for her BA degree in Drama with an emphasis on music from Principia College in Elsah, Illinois. 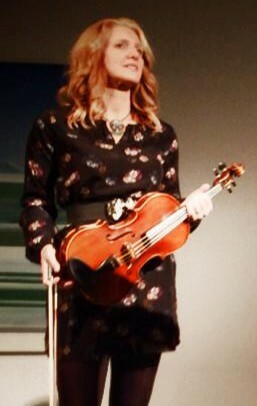 While there, in addition to picking up a perfectly winter-esque Midwest sport of collegiate springboard diving, she, her frozen hair, and her double-cased fiddle shivered their way through while serving as the Concertmistress and soloist for the College Music Ensemble. Upon graduation, Kathy was presented with the College's Francis Van Der Meid Smith Music Award for musical excellence, and the Frank Parker Theatre Award for greatest overall contribution to drama in the college theatre. Kathy's musical style took an exciting and eye-opening turn upon moving to Berkeley, CA in 1996. 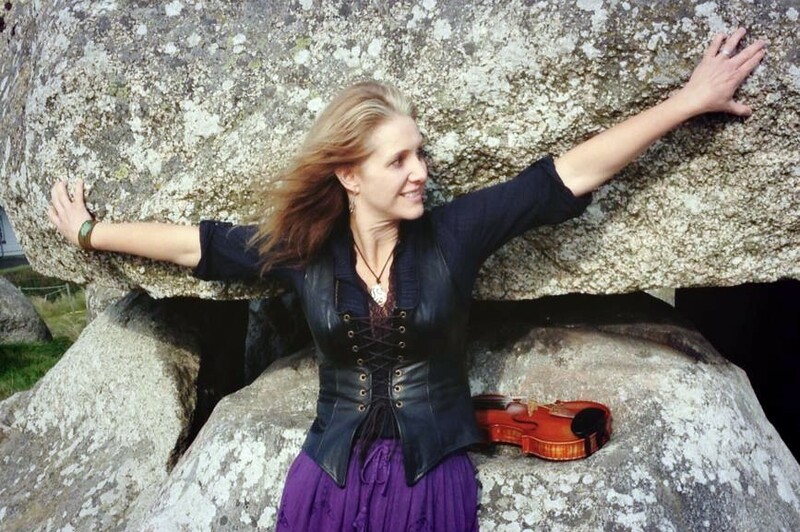 There she met violinist, producer, and composer Kaila Flexer, who became a mentor to Kathy on other styles of violin playing, including Irish and Scottish fiddle, Bulgarian folk, Klezmer and Jazz. 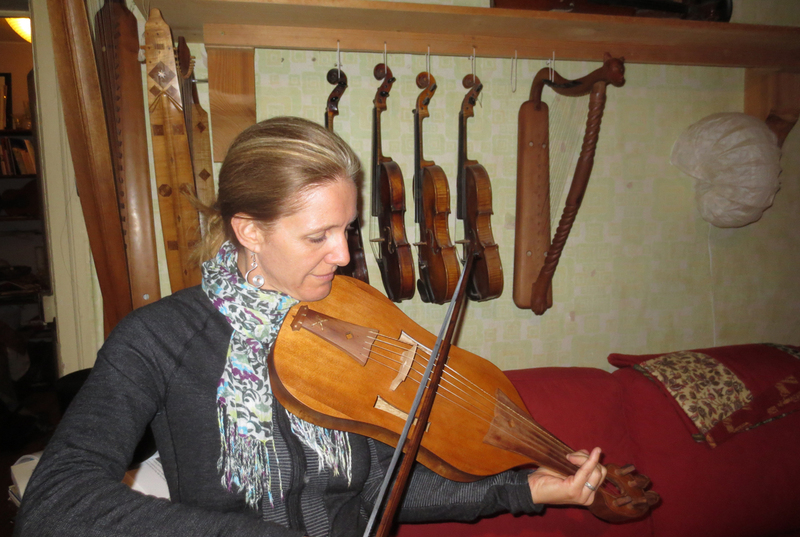 During this period, Kathy happily switched out of her tech-job getup to play music out in the community, including performing with The Gold Country Chamber Orchestra in Sacramento, CA, and the 1999 inaugural performance of The Cotati Philharmonic in Cotati, CA. It slowly dawned on Kathy in these Berkeley years that expressing herself as an artist was possibly her true calling. Could she consider taking a pay cut to live in a van and tour the world, embracing cultural experiences and making people happy with her music? "I wanted to make a contribution and a social impact though my artistry, and feel satisfied at the end of the day." Enter Golden Bough. in the SF Bay Area is playing a wealth of material centered around oldies and originals with Golden Bough guitarist band-mate Paul Espinoza. When Kathy is not out gallivanting the worlds stages in her dashing kilt, she is passing along the love of music in her private teaching studio on violin, guitar and whistle. she teaches chord-strumming technique, combined with singing. She and hubby John live in the San Joaquin Delta and have a seriously groovy 9-yr old daughter, Savannah.